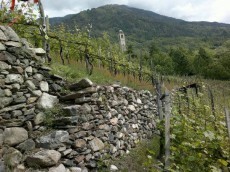 The vineyards are located in the wine production area of Valtellina Superiore DOCG. Part of the vineyards are ancient and are planted with hundred-year-old Nebbiolo vines, preserved with special care and attention. The rows are located in seven different areas around Contrada Balzarro. Canovi vineyard is the oldest and is planted in "rittocchino" (the rows are perpendicular to the slopes): some strains date back to the '30s, others to the beginning of the 20th Century. In 2008 the Wine Farm converted an area of ​​about 5000 square meters - known as Boffalora, a forest for 30 years - into a vineyard, with rows planted in "girapoggio" (contour farming - parallel to the slopes). 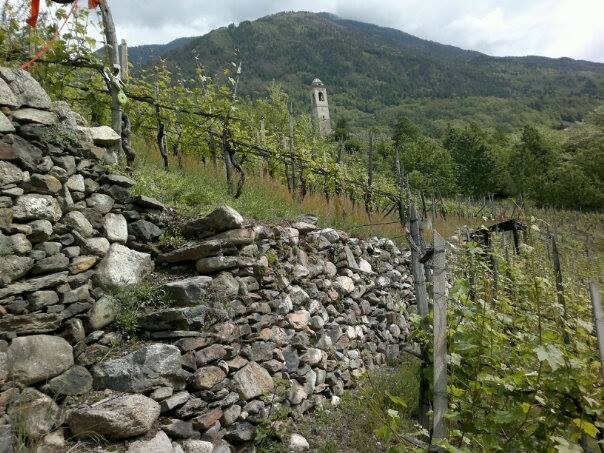 The last vineyard of 4000 steep square meters was purchased from an elderly person and planted with a new clone of Nebbiolo in the spring of 2013. The other four vineyards are located within the Contrada and make up a total of about 8,000 square meters. Traditionally the Wine Farm manages its vineyards with as little treatments as possible, leaving the rows covered with grass and drying up the bottom of the rows only once a year. Giuseppe indeed practices a type of agriculture that includes integrated pest management, so as to respect nature as much as possible. The presence of the bees in the vineyard, in fact, contributes to reduce the use of insecticides. The added value of the production area is biodiversity, although this makes the deriving process more tiring and difficult. Biodiversity generates naturally in the area as a result of the massive abandonment of wine-growing culture occurred over the years. This has favoured the development of a non-intensive culture of the vine, which coexists with different natural habitats, ecosystems such as the forest, its resources and its organisms. All this promotes a healthy development and land use, while maintaining balanced vital processes that are crucial in food production. The vine treatment takes place manually with the aid of small power barrows and freight ropeways only for harvesting, because of the steep slopes. Each hectare of vineyard requires 1,200/1,300 hours of work to produce Pietrisco and Umo wines.